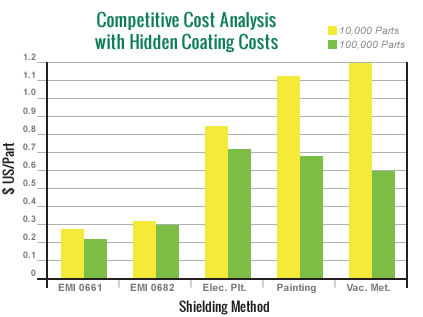 When comparing costs of conductive coatings versus EMI shielding compounds, it is important to consider the cost per piece, not the cost per pound. 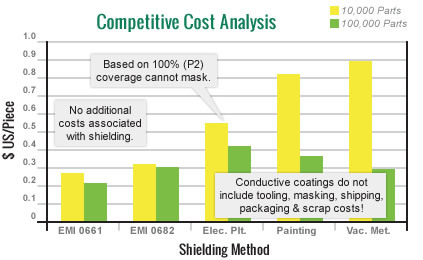 When this measure is used, EMI shielding compounds are less costly than conductive coatings. RTP Company conducted a study that compares cost per piece in achieving an EMI shielding level of at least 40 dB on a plastic part. The study considers RTP Company’s EMI shielding compounds versus three coating methods (painting, metallic plating, and vacuum metallizing). The plastic part is a type of cover 2 in x 2 in x 1/2 in (50.8 mm x 50.8 mm x 12.7 mm), with wall thickness of 0.120 in (3.048 mm). Costs reflect volumes of 10,000 and 100,000 parts. A drawing of the plastic part was submitted to several coaters. Their price includes a unit cost to apply the coating, a tooling/ fixturing/masking cost, and a scrap rate. The part design and shielding specifications were appropriate for a conductive coating process. Yet, even under such favorable conditions, EMI shielding compounds are competitive or less costly than conductive coatings for both low and high volume applications.